Just to give you a little idea of the bears that I saw on the drive today (the drive that ended up in Stewart, BC), I'm attaching five different pictures of black bears I snapped along the way. Thirty minutes later there was another bear. This is the first one that seemed angry to me. I think after a while, after you've seen 15+ bears and you're running late, you become something of a "bear snob". :) Actually, if I wasn't running late, I would have sat next to these guys as long as possible. Oops, and I can't forget the one I think is a caribou. This was actually the first large animal I saw, about two miles before I saw the first bear. 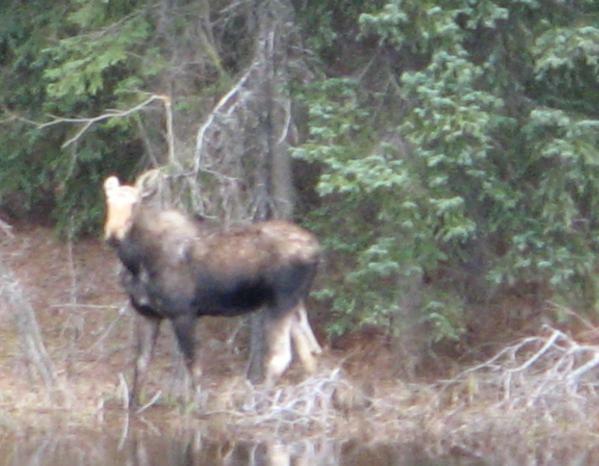 This guy was across a small pond, so I had to use both optical and digital zoom to get a decent picture of him.